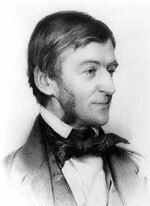 Ralph Waldo Emerson, born in Boston, Massachusetts, 25 May 1803; died in Concord, Massachusetts, 27 April 1882. He was the second of five sons of the Rev. William Emerson, minister of the 1st Church, Boston. Waldo entered the grammar school at the age of eight, and the Latin school, under Master Gould, in 1815; but neither here nor at Harvard did he show unusual ability. After leaving College he engaged in teaching, and began the study of theology under the direction of Dr. Channing, although not regularly enrolled at the Cambridge Divinity School. He read Plato, Augustine, Tillotson, Jeremy Taylor, and had from boyhood been an enthusiast regarding Montaigne's essays, of which he said: "It seems to me as if I had myself written the book in some former life." In 1826 he was "approbated to preach" by the Middlesex association of ministers; but his health forced him to pass the winter in South Carolina and Florida. He was ordained in March 1829, as colleague of Rev. Henry Ware, Jr., in the pastorate of the 2d Church, Boston, and succeeded to Ware's place within eighteen months. His preaching was eloquent, simple, and effective. He took part actively in the city's public affairs, and showed a deep interest in philanthropic movements, opening his Church, also, to the antislavery agitators. In 1832, however, he resigned his pastorate, and did not thereafter regularly resume ministerial labors. Having decided that the use of the elements in the communion was a mistaken formality the true communion, as he thought, being purely spiritual he refused to make the compromise proposed, that he should put his own construction on the Lord's supper, leaving his congregation to retain their view. The parting with his flock was friendly, and, although long misunderstood in certain quarters, he always maintained a strong sympathy with Christianity. Emerson preached in New Bedford, declined a call to settle there, and went to Concord, where he remained. In the next winter he began lecturing, the subjects of his choice being, curiously enough, "Water" and "The Relation of Man to the Globe." But he soon found themes better suited to his genius, in a course of biographical lectures given in Boston, discussing Luther, Milton, Burke, Michael Angelo, and George Fox. Two of these were published in the "North American Review." This course was followed by ten lectures on English literature in 1835, twelve on the philosophy of history in 1836, and in 1837 ten on human culture. Much of the matter embraced in them was afterward remolded and brought out in his later volumes of essays, or condensed into the rhythmic form of poems. In September of the same year his first book, "Nature," an idealistic prose essay in eight chapters which had been written in the same room of the "Old Manse" in which Hawthorne afterward wrote his "Mosses" was published anonymously in Boston. During the summer he had supplied the pulpit of the Concord Unitarian Church for three months, and in the autumn he preached a while for a new society at East Lexington; but he refused to become its pastor, saying: " My pulpit is the lyceum platform." Doubts had arisen in his mind as to the wisdom of public prayer, the propriety of offering prayer for others, and the rightfulness of adhering to any formal worship. From this time his career became distinctively that of a literary man, although for several years he confined himself mainly to lecturing, and most of his prose writings were first given to the public orally. Carlyle had said to Longfellow that when Emerson came to Craigenputtock it was "like the visit of an angel." The term transcendentalists was somewhat vaguely applied to a number of writers, among whom Emerson was the chief; but they did not constitute a regularly organized group, and had no very well defined aims in common that could warrant the classification. Emerson himself disclaimed it later, saying "there was no concert of doctrinaires to establish certain opinions or to inaugurate some movement in literature, philosophy, or religion . . . but only two or three men and women, who read alone, with some vivacity. Perhaps all of these were surprised at the rumor that they were a school or a sect, but more especially at the name of 'Transcendentalism.'" The Symposium, or Transcendental Club, began to meet in 1836, first at the house of Dr. George Ripley. Among the members were Emerson, Frederic H. Hedge, James Freeman Clarke, Convers Francis, Theodore Parker, Bronson Alcott, Rev. Cyrus A. Bartol, Orestes A. Brownson, Margaret Fuller, and Miss Elizabeth P. Peabody. Dr. Channing once attended, and was in sympathy with the club, which discussed religion, impersonality, justice, truth, mysticism, pantheism, and the development of American genius. In this last theme perhaps lay the germ of Emerson's oration, "The American Scholar," delivered before the Phi Beta Kappa society at Cambridge in August 1837. This has been well called "our intellectual Declaration of Independence," an event without any former parallel in our literary annals. After eloquently describing the education and duties of the scholar, it protested against the prevailing subservience to European taste, suspected the American freeman of being "timid, imitative, tame," and demanded that the individual man "plant himself indomitably on his instincts and there abide .... We will walk on our own feet; we will work with our own hands; we will speak our own minds .... A nation of freemen will for the first time exist, because each believes himself inspired by the Divine Soul which inspires all men." It was Emerson's mission not to do practical work for reforms, but to supply impulses and a high inspiration to the workers. In 1841 he lectured on "The Conservative," and the next year on "The Transcendentalist," saying that "transcendentalism" was simply modern idealism, and that the "new views" were the oldest of thoughts cast in a new mould. Yet, seven years before, he had consulted with others about establishing a journal to be known as "The Transcendentalist," and in July. 1840, it was begun, under the name of "The Dial." Emerson was tall and slender, not of robust physique, rather sallow in the face, with an aquiline nose, brown hair, and eyes of the "strongest and brightest blue." His head was below the average in circumference, long, narrow, but more nearly equal in anterior and posterior breadth than most heads, His appearance was majestic. He was calm, kindly in expression, and frequently smiled, but seldom laughed. His manners were dignified but exquisitely simple. He was a ready listener, and often seemed to prefer listening, as if he were to be instructed rather than to instruct. He rarely showed irritation. His hospitality was almost unbounded, and he frequently waited upon the humblest of his guests with his own hands. He was never well-to-do until in his latest years. In 1838 he wrote to Carlyle that he possessed about $22,000 at interest, and could earn $800 in a winter by lecturing, but never had a dollar "to spend on a fancy." He worked hard every summer writing, and every winter traveling and lecturing. His habits were regular and his diet frugal, the only peptic luxury in which he indulged being pie at breakfast. Every morning was spent in his study, and he would go all day without food unless called to eat. His bedtime was ten o'clock, but, if engaged in literary work, he would sit up until one or two, and was able to do this night after night. He fulfilled the duties of a citizen by attending town meetings punctiliously. Much question has been made whether Emerson was rather a poet than a philosopher, or whether he was a philosopher at all. An exact philosopher he was not; but all that he wrote and said was based upon philosophic ideas. He was an intellectual rather than an emotional mystic, an idealist who insisted upon the application of idealism to the affairs of daily life. He believed that "Nature is the incarnation of a thought The world is mind precipitated." He believed in the Over Soul as a light guiding man, the light of intuitive perception, in God as the soul of the world, and in the human soul as one with that Over Soul. He was not able to formulate these or other beliefs of his logically. Writing to his former colleague, Henry Ware, he said" "I could not give an account of myself if challenged I do not know what arguments are in reference to any expression of a thought. I delight in telling what I think but if you ask me how I dare say so, or why it is so, I am the most helpless of mortal men." This continued to be his position to the end. He relied upon intuition, and thought that every one might bring himself into accord with God on that basis, He expressed what he felt at the moment, and some of his sayings, even in a single essay, seem to be mutually opposed. But if the whole of his works be taken together, a type of thought may be discerned in the conflicting expressions, coherent and suggestive, like that presented by the photographs of several generations of a family superimposed on one plate. In the beginning he seems to have looked somewhat askance at science; but in the 1849 edition of "Nature" he prefixed some verses that said: "And, striving to be man, the worm Mounts through all the spires of form." This came out ten years before Darwin's "Origin of Species," and twenty years sooner than "The Descent of Man." Lamarck's theories, however, had been popularized in 1844. But Emerson here showed how quick he was to seize upon the newest thought in science or elsewhere if it seemed to be true. Eleven years passed, and he declared in the essay on "Worship," in "Conduct of Life The religion which is to guide and fulfill the present and coming ages must be intellectual. The scientific mind must have a faith which is science There will be a new Church founded on moral science, at first cold and naked, but it will have heaven and earth: for its beams and rafters, science for symbol and illustration. It will fast enough gather beauty, music, picture, poetry."